The dictionary definition is a shape, with a square base and four triangular sides that meet at the top. If you are thinking of a large, monumental structure built in that shape, immediately you think of Egypt. A pyramid is the icon of Egypt. Despite that stereotype, Egypt is not the only place with pyramids. Egypt has about 155 known pyramids, discovered so far. Satellite imagery is revealing more and more structures in the desert and there are more pyramids hidden with them. Nevertheless, there are thousands of other pyramids, world-wide, on all six continents. There are 43 in Sicily and Sardinia. There are 16 in Greece. India has 224. There are pyramids in the Sudan, in Java, in the biblical Ur of Iraq. In the Shaanxi province of China, 250 pyramids of various sizes have been catalogued by aerial and satellite surveillance. For some reason, they have all been systematically covered with trees and shrubbery by the Chinese government and surrounded by what is called “The Forbidden Zone,” a no-go zone for anyone not living and farming in the area. There are three in Korea. There is one in Maráe, Tahiti. There are seven in Mauritius, an island of the Indian Ocean. In the Canary Islands, there are dozens. They exist in the waters off of Cuba, a half a mile below the surface of the current ocean, on the sea floor. There are 300 in Peru and several at Montevecchia, in Milan, Italy. The grand prize for overachieving has to go to Central America, however, which has 10,000 (with more being discovered in the jungle all the time). These were built by the Maya in what are now Mexico, Guatemala, El Salvador and Honduras. 1. Geometry – they all have a rectangular or square base and four triangular or trapezoidal sides. 2. Orientation - The sides of the very oldest pyramids are always aligned either to cosmic or magnetic north. Cosmic north is determined by the stars, the Pole Star (Polaris) especially, and is slightly different from magnetic north, by a few degrees. The magnetic compass is supposed to be a fairly recent invention (1,000 A.D.). So how did the ancients know that magnetic north even existed? 3. Artificially shaped construction materials. If the pyramid is made of stone, for instance, the stones are shaped and fitted - not just natural rocks stacked up. 4. There are inner passages within the pyramid. 5. There are one or more water sources nearby. 6. 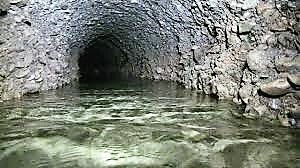 There is an underground waterway. 7. They are made with extraordinary precision. The mathematical and engineering exactitude is always of the highest caliber and would be a great challenge even for today’s builders and engineers, with their modern instruments and equipment. This brings us to the Bosnian pyramids. In 2005, Semir Osmanagich (Ŏz-mahn-áh-gitch), a Bosnian born, Houston based professor of anthropology, was traveling through the small town of Visoko, Bosnia, 20 miles northwest of the capital city of Sarajevo.. He had been doing extensive research on pyramids around the world and as he cast his eyes upward to the hills surrounding the village, he noticed one that clearly had straight lines, angled edges and a pyramidal shape. Traveling around the hill, he could see that all four sides had regular faces that formed a pyramid. Checking his compass, he saw that the sides were oriented to the cardinal points. View of the largest and most defined anomaly, the "Pyramid of the Sun." 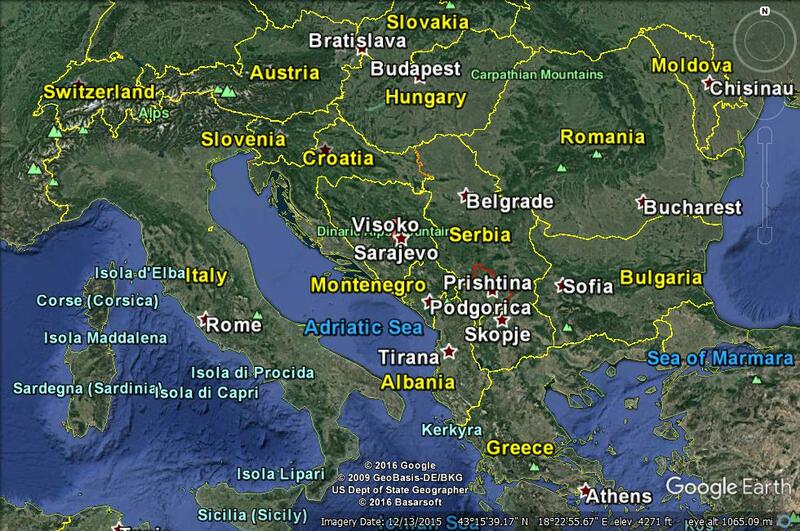 Excited about his discovery, he first tried to get Bosnian government involvement in researching this strange site. 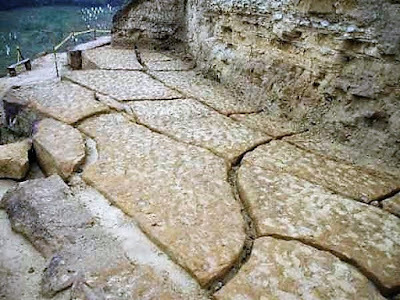 When they showed no interest, he formed the "Archaeological Park: Bosnian Pyramid of the Sun," a non-profit organization, which proceeded to mount attempts to examine the strange geologic feature. This was, to my mind, a very good thing. Instead of the usual governmental or academic compartmentalization and suppression of whatever information they didn’t like, this organization has invited scientists from all over the world, and from all disciplines, to contribute. They only ask that the researchers don’t destroy anything and that they share their findings with the organization, which publishes them to the world. 1. One theory is that these formations are natural results of the up pushing of tectonic plates. 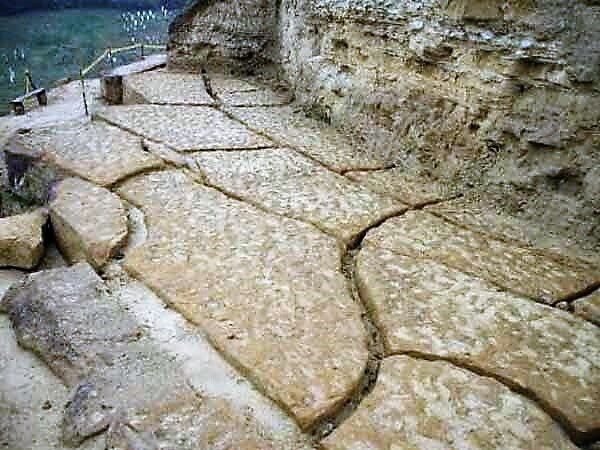 Geologists ruled that the geo-morphological shape does not coincide with the known plate movement in the area. The direction that the plates are moving would not have pushed up these shapes at this angle. 2. Five pyramidal shapes have been identified in the vicinity, so far. 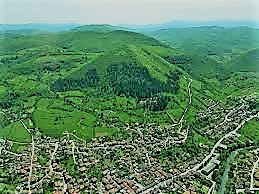 Research has focused primarily around the largest and most clearly defined feature, which has been designated “The Pyramid of the Sun.” If you zoom in to the Visoko area on Google maps, you can clearly see that the shadow of the mountain is a perfect equilateral triangle. 3. All of the pyramids have regular geometry – four triangular faces and sharp lines. The sides are precisely aligned to the cardinal points. The angles are all exactly 35 or 45 degrees – not 42 degrees or 46.5, but exactly 35 or 45 degrees. 4. The Pyramid of the Sun measures 722 feet square by 450 feet high, twice the size of the great pyramid of Giza. The slope of the sides of the buried side surfaces of the pyramid are constant, from bottom to top. 5. Civil engineers used surface based ground penetrating radar that reached 55 feet deep. 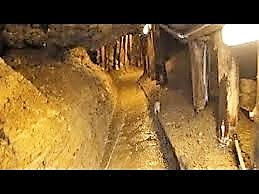 They located 49 unnatural anomalies – blocks, tunnels and passages. 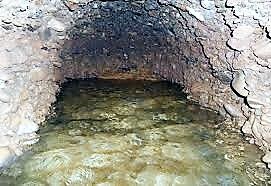 The scans showed a paved entrance way leading up to the edge of the pyramid, underground tunnels and chambers. 6. Thermal scans show that the pyramids cool faster at night than the surrounding terrain, because the structures are hollow, due to the passages and chambers. 7. Biologists report that the surface of the pyramid is 10 degrees warmer than the surrounding countryside. 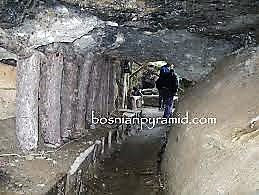 Because of this, the vegetation growing on the pyramid is usually found in the Mediterranean, rather than in Bosnia. 8. Satellite based and military ground penetrating radar both identified large, straight tunnels stretching for miles, both under the pyramid and beyond it, in three levels. 9. Military ground penetrating radar mapped tunnels within the pyramid forming spirals up into the structure. The tunnels run 280 feet below the top of the pyramid. 10. Polycontrast Interference Photography (PIP), a technology that takes visual images of the electromagnetic field over a landscape, shows field layers that are horizontal over the rest of the countryside, but form vertical lines over the pyramids. 11. There is NO radioactivity in the area of the pyramid. The levels read are 10 times below the norm. 12. Multiple physicists have confirmed that there is an ultrasonic wave being emitted from a 13-foot-wide circle on the top of the pyramid and grows stronger the higher above the pyramid that the readings are taken. The wave form is completely regular, always at 28 kHz, like a machine, totally unlike any other natural emission, either nearby or anywhere else. 13. Geophysicists from varying agencies used seismic refraction (setting off explosions and reading the echoes from the subsurface features). All of the different scans corroborated each other and the radar images. Seismic readings match the readings taken from the Great Pyramids of Egypt. 14. Core samples showed that the material of the pyramids is non-compact, not a natural result of ordinary sedimentation. 16. 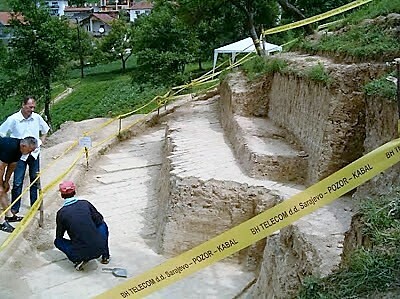 So far, 47 archaeological trenches have been dug. 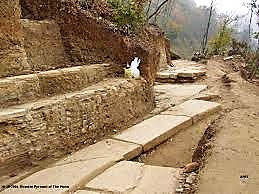 They have found equidistant and regular steps, pavement, walls, terraces. Three different levels of pavement. 17. The sandstone and concrete that compose these features are arranged in layers. 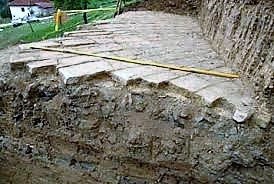 Clay is used as mortar between the blocks, which binds it with a flexible bond and acts as an insulation. 18. 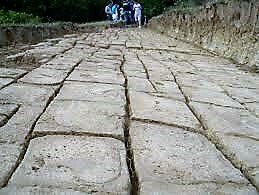 The rectangular blocks that have been excavated on the sides of the pyramid hill measure, on the average, 5 feet x 30 feet x 1.5 feet. They weigh about 1,600 lbs., which is around .7 tons. If the entire Pyramid of the Sun is all covered, it would take 18 million tons of concrete to cover it. Concrete blocks up to 80 tons have been located, so far. 19. Six different construction material labs analyzed samples of the concrete. They all concluded that the concrete was definitely artificial and was three times the hardness and durability of any other known form of concrete. 20. The durability and hardness of the concrete comes from the fact that the stone and gravel used in the concrete is bound together by the local clay. 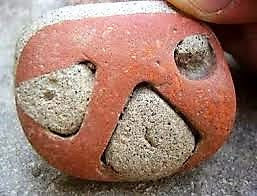 This clay must have been heated to 500 degrees or more, to set and harden it. 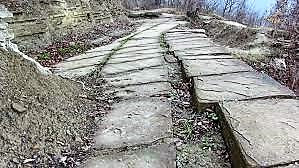 In other words, the pavement and sides of the structures are made of 3/4 ton bricks. Who has a kiln that can produce that number of 1,600 lb. bricks? Who builds with things that big? 21. The tunnel excavations have yielded artifacts. Megaliths weighing 18,000 lbs (that’s 9 tons, or 9 times the weight of a car) formed of artificial ceramics, have runes impressed (not carved) into their surfaces. One of the rune covered monoliths. 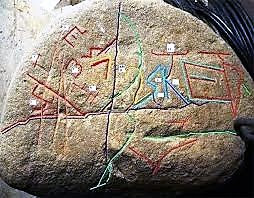 Color has been added digitally to highlight the different runes. Let me emphasize that the writing (similar to ancient Hungarian runic scripts developed in the Carpathian Basin) were impressed into the stones, not chiseled. 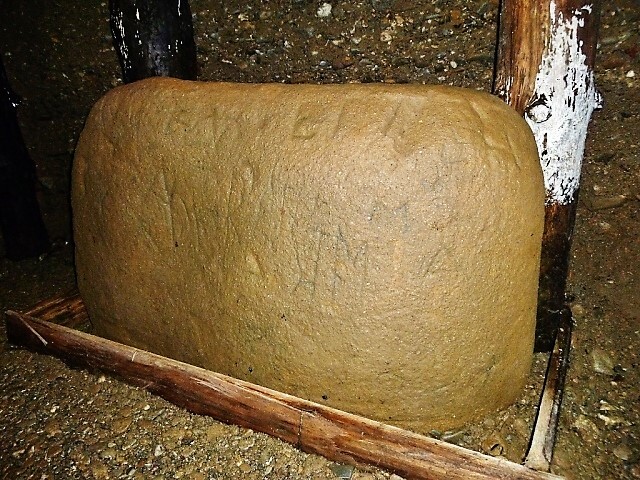 That is, someone took a wet, soft piece of ceramic (like pottery) that weighed 9 tons and pressed runic letters into it before firing it and then moving it into the tunnel. Nature could not have made these stones. 22. 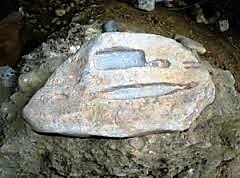 Containers, tools and molds made to cast metal objects have also been found. Molds to make a knife blade and a cleaver. 23. Many of the passages conduct water, which tests exceptionally pure. What are we to conclude from this information? An oddly carved stone from the tunnels. Red stone with gray stone inserts. 1. A great deal more research is needed. 2. The feature designated as The Pyramid of the Sun has all seven features of pyramids from around the world, mentioned on the list above. 3. Once again, artifices and artifacts have been found, of a style and an expertise level that has never been previously seen, made by an unknown people previously unsuspected. 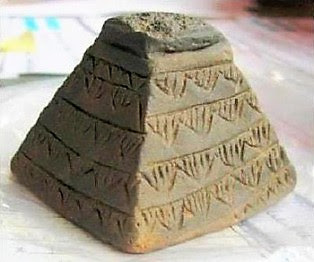 A ceramic pyramid found in the tunnels. Perhaps the world's first souvenir? Or a model of what the entire pyramid may look like? 4. The constructions, both the individual components and in total, are enormous in size. 5. No historical evidence of these structures has previously existed. 6. A swarm of little guys in loin cloths, using ropes and stone axes, absolutely did not manufacture these features and then assemble them into place.